Cyrus Streamline review | What Hi-Fi? Music streamers are a serious business, and some of the most respected hi-fi manufacturers are now getting in on the act. Naim has made waves with its UnitiQute, and now it’s time for Cyrus to step into the spotlight with the Streamline. The Streamline is the first of three Cyrus music streamers – but it’s the only one to boast internal amplification, at 30W per channel. It uses the same chassis found on Cyrus’s other two-channel components. The front panel hosts control buttons and a control knob, which can be used to navigate menus. The display could be easier to read, and scrolling text can judder, but Cyrus’s custom-built ‘n-remote’ makes these criticisms moot. Cyrus has invested heavily in programming and software to produce its own universal wand, which can do anything a customer could want. The Streamline is compatible with UPnP servers. Cyrus recommends you connect using an ethernet switch for optimum sound quality (though a wireless adaptor is included). Once you’re hooked up and turned on, the Streamline recognises all the sources at its disposal. File support covers all the main formats: WAV, FLAC, MP3, AAC, AIFF and 24Bit/96kHz, but not Apple Lossless or (fairly rare) 24Bit/192kHz files. Stream a few CD-quality WAV files and the Cyrus makes an immediate impact, with a wonderfully open and inviting soundstage . It extracts a stunning level of detail. Instruments and vocals are beautifully layered and music sounds fluid yet unhurried, allowing the listener to savour every moment. Spin Rihanna’s Love The Way You Lie (Part II) and the Cyrus takes you on an emotional journey, each verse delivered with feeling and precision. The Streamline’s appeal doesn’t stop with high-quality music files. Even relatively low-resolution digital music files – we’re talking 320kbps or 192kbps – are presented as a listenable package. Inevitably, compressed files lack the subtlety, spaciousness and fine detail of full-fat music files, but they sound more than musical enough. Spin a 320kbps version of Kanye West’s Monster and the Cyrus does a fine job of layering the various elements of the track. Listening to TuneIn internet radio has its ups and downs, mainly when you come across ridiculously low-bitrate stations. Anything around 31kbps sounds like a flaky mess, but fed the 192kbps stream from Rock Radio 1 the Cyrus does a great job despite the limitations. Electric guitars still wail convincingly and drum solos are hammered out with authority. 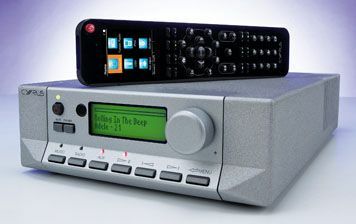 Compared with some streaming systems already on the market, the Cyrus isn’t cheap – but the sound quality and cleverness of the system makes it easier to part with your money. If you really want to make the most of your networked music, we think it’s a relatively small price to pay.